Endesa, a Spanish and Portuguese energy provider, has inaugurated a public Compressed Natural Gas (CNG) filling station in Zaragoza, the capital of northeastern Spain’s Aragon region. 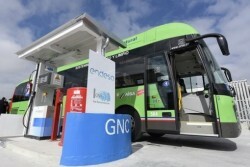 It is the second CNG station in the city and has been constructed as part of Endesa’s intention to create its own natural gas refuelling network. Endesa stations have already been opened in Palma de Mallorca and Madrid. The new setup, comprising a CNG dispenser, a regulating and measuring system, and a 100Nm3/h compressor with internal storage, has capacity to refuel 150 vehicles. It is expected that with the increased availability of CNG, more vehicles will switch to natural gas, with the transition dominated by taxis. Accordingly, the new facility is located as the city’s Auto-Taxi Cooperative depot where is is open all year round for public access. According to local news source Aragon Digital, a vehicle operating solely on CNG will be able to travel from Zaragoza to Madrid and return for just EUR 8 (USD 8.95).